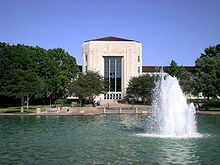 The University of Houston is a public university in Houston, Texas. It was started in 1927, and has nearly 35,000 students. ↑ "UH at a Glance". University of Houston. Retrieved 2008-07-22. This page was last changed on 22 March 2018, at 02:50.